...the volunteer manager who wants a higher level of collaboration and engagement with their volunteers. Most of our users are busy people and YourVolunteers was designed to make their lives easier. You, as the volunteer manager, create shifts through the service and volunteers are able to see those shifts when they login. 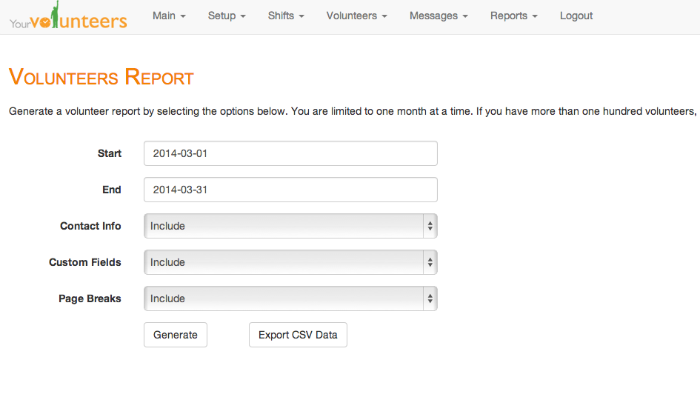 By default, they are able to select from those shifts, but you are able to "lock" your volunteer focus. If you, as the volunteer manager, add a volunteer to your volunteer focus, they receive an email letting them know that they have access to the site. Sorry, but this is non-negotiable. If someone were to put your information into a database accessible through the Internet, wouldn't you want to know? ...the volunteer manager who wants one hundred percent control over the scheduling of their volunteers. If you are a manager who wants to keep the shifts a secret, which is completely your right, then you should perhaps look at volunteer software programs where all information is kept on your computer or on your organization's server. You can then create a basic Google Docs sign up form and move the volunteer information into your database.